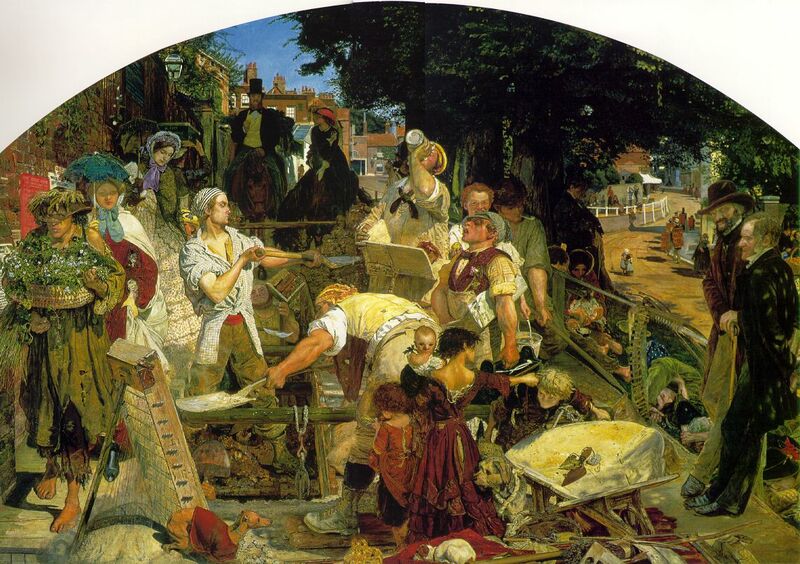 Madox Brown was born in the Victorian England of the 19th century. After studying art in Antwerp, he devoted himself to painting without much success. His most important work was Work (no pun intended). Commissioned by an English collector, the artist wanted to include in his painting all the social strata of his community. In the canvas, we see Heath Street, in the London neighborhood of Hampstead. In the scene, we can find, then, characters that represent each one of the social classes: at the left and at the foreground, we will observe a woman and children dressed in rags, who represent the lower class of the society, the beggars; in the centre, we will see men digging a well; on the extreme left, under small umbrellas, we will find two women representing the middle class; to the right, leaned on a rail, two individuals of the upper class look at the action indifferently; and, at last, on the background, we will see a couple riding horses, which indicates that they represent the bon vivants of the society. The artist took 12 years to finish the work. As a result, he leaves us an over detailed and complicated canvas. To exhibit the painting for the first time, the artist had to write a catalogue to interpret it, which supports my point of view: the work is only effective if you look closely to each area. This, as I think, takes away all the electivity of impressing at first glance, when we perceive everything as a whole. ~ by Álvaro Mazzino on January 12, 2011. This entry was posted on January 12, 2011 at 17:06 and is filed under Realism.You can follow any responses to this entry through the RSS 2.0 feed.You can leave a response, or trackback from your own site.